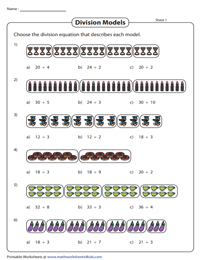 Teach an interesting division strategy of grouping objects with this unit of division model worksheets, hand-picked for kids of grade 3. 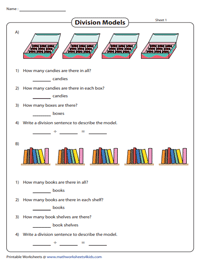 Included here are exercises such as group the objects, answer questions based on the model, complete the division statements, fill in the missing part of the equation, draw models and more. 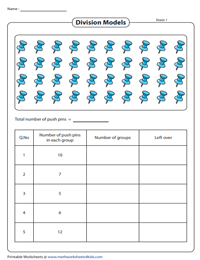 Additionally, find PDFs to introduce the concept of grouping with left over. 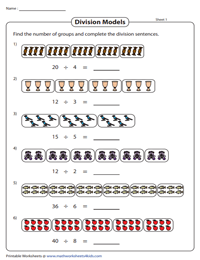 Train kids in this basic division skill of making equal groups. Figure out how many groups can be made, by counting the objects and enclosing them in a circle based on the indicated size of the group. Observe the equal distribution of objects into groups and answer the questions based on the model. The total number of objects and the size of the group is mentioned in the division sentences. 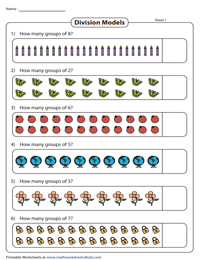 Work out the quotient by counting the number of groups. Each worksheet here consists of two parts. 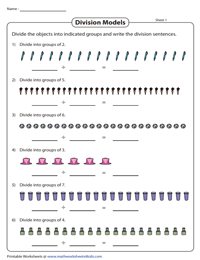 Examine the groups and the number of objects in each group in Part A to write the sentence. 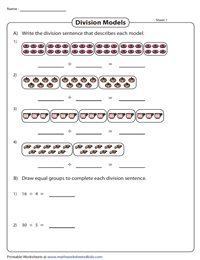 Draw the model based on the division statement in Part B.
Plug in the number of objects, the number of groups or the objects in each group and complete the division sentences. 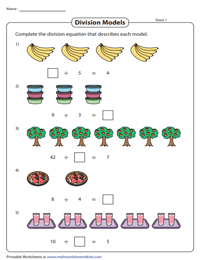 Recapitulate the concept of equal grouping with this batch of MCQ worksheets. Study the models carefully and check the division sentence that describes it. Divide the objects evenly into groups by circling the specified number of objects. 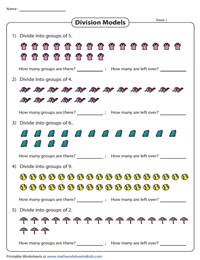 Count the number of groups formed and write the division equations in this stack of 3rd-grade group-and-divide worksheets. Familiarize kids with the concept of left overs using this compilation of worksheets. Divide the objects according to the size of the group specified and figure out the number of groups formed and the left overs. Count the number of objects and divide them into groups according to the number indicated. Find the number of groups and the left overs to complete the tables.